How does USAID (U.S. Agency for International Development) prepare for famine assistance to the world’s neediest? One success story is the Famine Early Warning Systems Network at www.fews.net. Blue Raster assisted in releasing the new FEWS NET and is proud to partner with Chemonics International and Forum One in launching the new tool. Blue Raster automated the generation of forecasting maps for the 37 monitored countries, making the maps available sooner to decision makers. Two side-by-side comparative maps of food-security outlooks are produced for every region, and the countries are colored according to their food security, highlighting areas of Stress, Crisis, Emergency and Famine. FEWS NET is a collaboration of international, regional and national partners to provide timely and rigorous early-warning and vulnerability information on emerging and evolving food security issues. 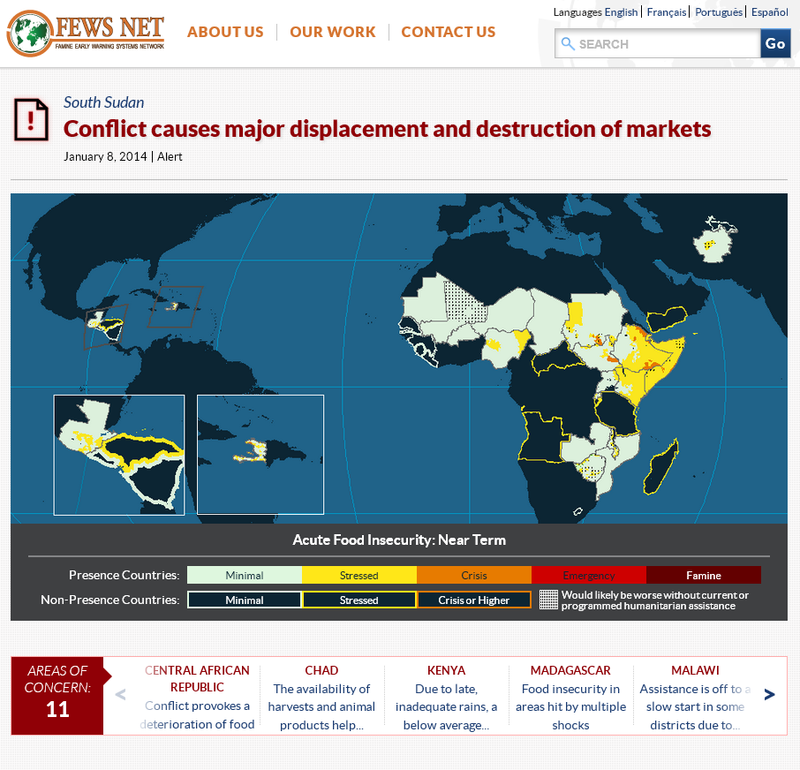 Once identified, FEWS NET uses a suite of communications and decision-support products to help decision makers act to mitigate food insecurity. The tech behind the site are ArcGIS Desktop and Python Tools as well as ArcGIS Server delivering dynamic maps. Node.js delivers both dynamic and static maps as needed throughout the Drupal CMS, with tight integration allowing Drupal admins to access maps for report pages during periodic updates. The servers are hosted in the Amazon Cloud environment taking advantage of S3 as well.